Blogs have become one of the most important needs for the creation of an online presence of a particular business or company. The best part about maintaining a blog is that you need not follow any fixed rules. Though, it might seem very much grueling to maintain constant readers to your blog. 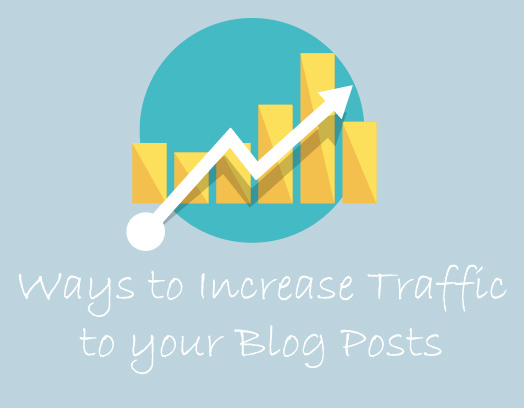 There are certain simple ways by which you can increase the traffic to your blog posts. The 10 simple ways are listed below. These are the ways which are tested and proved by a lot of bloggers. In fact, these are the ways suggested by the blogger community themselves. There are hardly few people who do not use social media on a day to day basis. Social media has become an inevitable portion of everyone’s life. Being a blogger, you must make sure the time users spend on your social media handle is worth the while. Prefer sponsored posts once in a while so that you can boost your posts. Add a social media share button at the end of each blog post. If you do not add a social media button at the end of every page, make sure to share the link of your blog posts in social media accounts. If your social media grows in size, it sure does provide a great platform for you to increase your blog traffic. Instagram, Facebook,and Twitter should never be missed out on your list of social media handles. You can include the other social media platforms too. It does not cost you. If you have invested some of your time and energy in someone else’s blog that carries the range of audience you are looking for, then you can divert those readers to your blog too. To ask the other bloggers to provide space for guest posts would require you to increase your networking capacity. Attend a lot of bloggers meet and engage in the sharing of ideas to make contacts to post guest articles. The guest posts stand as a testimony as to how much you are sure of the services/products your company renders. This, in turn, creates a good image of your business in the minds of the customers. They say Pictures speak louder than words. It is proven right with the inclusion of photos and videos which drives a lot of traffic to your site. There is one amazing fact about the inclusion of photos. Using the Alt key, you can add more keywords to the pictures. When you are using too much of keywords in your content, it sure doesn’t look great. This is a better alternative. The Google owns YouTube and there is no doubt if your blog gets a lot of attention after adding short and crisp videos to your content. Not everyone is really happy about reading, few would prefer to watch videos to grasp things quickly instead of reading the entire content. In this way, your blog drags all types of audience. While adding photos and videos, it should never face the issue of plagiarism and copyrights. Google is very particular about this fact. This ends up in increasing the traffic to your blog via the video hosting website YouTube. When you speak about increasing traffic to your blog, you cannot miss out on the fact of including keywords in the right portions of the article to drive a lot of traffic. Include keywords in the title of the article, at least twice in the content, in the headline and make sure the KW is present in the URL to your page. Have an idea of the keywords which people would use while searching for a particular content which also happens to be the content you would be posting on your site. When speaking about SEO, you should never forget the fact that Keyword is the heart of SEO. Whenever you put up an article or any relevant content on your blog, make sure it meets to the standard of matching with keywords. The fresher the content of your blog, the better the traffic. It is always advised to update your blog at least thrice a week. If you don’t have anything to post, then give space for guest posts. The guest posts also indicate that your blog is being constantly updated. No one would like to read an old, outdated blog. So, keep writing more. But, on the pretext of updating the content of your blog, never compromise on quality. The better the quality, the better the viewership. It is better to hire writers for your blog. The professional writers have a better idea of the content that would speak more by itself. It is very hard and impossible for a business person to don several roles at a time. It is better to look for specified talents in the country. If you are looking for a marketing strategy that would not cost you a hole in the pocket but at the same time provide you with amazing results, then you must be choosing Email marketing. There are a lot of ways by which you can obtain the mail ID of the viewers of your blog. Once you obtain the mail IDs, you can send them newsletters of your blog. You can also send them the agenda of events you have planned for your business. This would actually create a better bonding between the customer and the business owner. It is better to send greetings via mail rather than using the mobile phone number. These are some of the behaviors exhibited by the blogger which would show the value he contains for his readers. This is one of the latest fads followed by the bloggers. When you use this type of strategy, then the readers of your blog themselves would be the reason for the increase in readership. When you conduct give away events, you would ask the readers of your page to share the link of your blog in any of their social media handle. In this way, you are managing and creating awareness for your brand. This is made possible because the traffic of your blog is increased by the kinds of blog posts. This is not a costly affair as you would be investing very less compared to the other tactics for increasing blog traffic. There will be one winner at the end for any give away that is conducted. The users need to be engaged in this platform. There are a lot of blogs that do not encourage user discussions by disabling the comments section. But, that is not actually encouraged. There is a lot of evidence to prove that the community discussions make people coming back to the blog. There are also SEO studies that state, the more the user engagement on a blog, the better the reach of the blog. So, being a blogger, one should never mind about the criticisms. The bloggers should have the mindset to accept both constructive and destructive criticisms. This also shows how the blogger is open-minded and is ready to listen to the views of the reader. This, in turn, leads to a surge in the business. The provision of backlinks is beneficial to both the bloggers and the readers. The readers can get a broader view of the answers to the questions. The readers can also get to understand the views of different bloggers. In the case of bloggers, it is a win-win situation where the bloggers can enjoy the increase in the number of visitors. The bloggers can also share a lot of ideas to drive more traffic to the page. The provision of backlinks is also one of the best ways to earn with your blog. If you are planning to earn with the help of your blog, do accept the backlink offers from other companies provided the blog content of the product matches the nature of your blog. It is no crime to retweet or repoststhe older content of your blog provided the content is relevant in today’s pretext. There are a lot of successful bloggers who have retweeted or reposted the older content and have made it big. The titles also play a vital role in increasing the traffic of your blog. The titles are checked for compatibility with the keywords used for the search. It is always better to use the titles which incorporate the keywords. The titles are the first thing a reader notices in a blog. When the title is fine, everything else is fine. There are a lot of SEO techniques that can be used for enhancing the number of visitors to your blog. It is also suggested to keep oneself technically sound. It is very frustrating to maintain a blog but once you have mastered the methods to increase the blog visits, you can enjoy a plethora of benefits.